Estrella, known to her family and friends as “Star,” a rising second-grader at Merry Oaks Elementary School in Charlotte, is enjoying a summer camp different from the kind you might remember. At 10 a.m., she enters a classroom wearing her backpack, a ponytail and a smile. Star heads straight for Brittany Anderson, a licensed teacher from Windsor Park Elementary School and her instructor for the next hour. They begin with practice on letter sounds. From there, Anderson and Star work on phonemic awareness activities, breaking words into three parts with the help of a simple visual cue. Star reads a series of words by sounding out the word, then reading it fast—“/j-o-g/ jog!” She is expected to move quickly, but every misstep is corrected. As Anderson and other instructors prompt responses, a cacophony of tiny voices crackle and echo against the walls. Campers lean across tables. Hands wave in the air. Celebratory high fives are exchanged. The group is making its way through a scripted program called Sound Partners, a proven intervention designed to help children get better at phonics and beginning reading. This kind of one-on-one instruction isn’t feasible in typical K-12 classrooms, but it’s exactly what Star needs to get back on track with her literacy skills. “Some students need more explicit instruction, opportunities to respond and repetitive practice than is often possible in a general education classroom,” said Assistant Professor Kristen Beach, lead researcher on a Cato College of Education study of this new approach to summer break designed specifically for struggling readers. Star and 59 other second- and third-graders are attending five weeks of free, daylong camp designed to help them improve their reading while enjoying the fun and games of traditional summer camps. 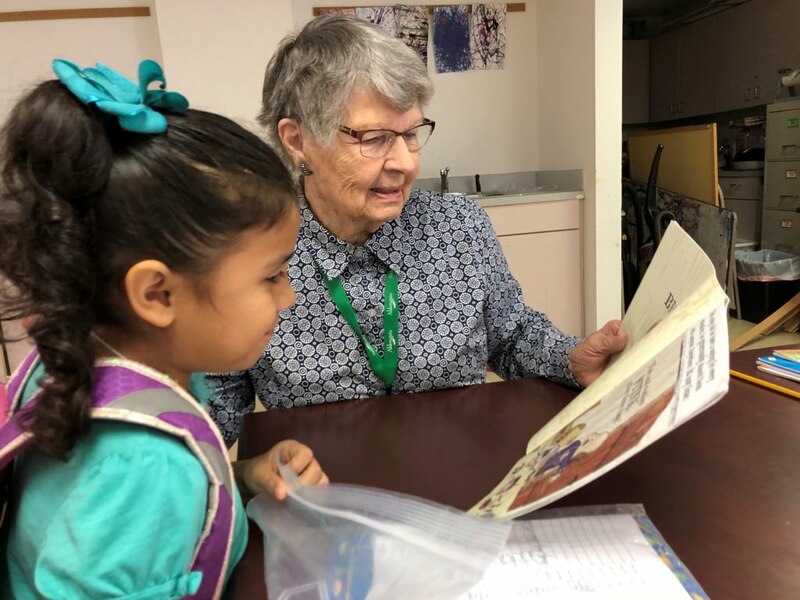 The specially selected students from three Title I east Charlotte elementary schools (Windsor Park, Merry Oaks and Winterfield) receive two hours of intensive one-on-one or small group reading instruction every day. Now in its third year, the camp is part of a UNC Charlotte effort to address the city’s early literacy shortfalls. And new peer-reviewed research by Cato College of Education faculty reveals the program helps at-risk readers avoid falling behind over the summer, and gives many a significant leg up. “Our initial findings indicate that we prevented the common phenomenon of the ‘summer slide’--that is, the tendency for students to not only stop advancing, but experience a decline in reading skills during the summer months. It also appears that rising third-graders improved in reading comprehension, and that rising second- graders improved on early literacy skills,” Beach said. Most strikingly, the group found that in 2016 and 2017, rising third-graders made an equivalent of approximately 11-weeks growth in oral reading fluency over the course of the camp. The significance of such growth is hard to overstate. Nothing predicts school success better than third- grade reading. Ninety-six percent of students who read proficiently by third grade will graduate on time; those who don’t are four times more likely to drop out of high school. Currently, only 39 percent of Charlotte third-graders read proficiently. Students from affluent backgrounds, who generally test higher in reading, also often have more school-like summer opportunities than those from lower-income or limited English households, leaving the latter more at risk of the summer slide. A 2007 study found that by ninth grade, more than half the gap in reading comprehension between middle- and low-income students is attributable to differences accumulated in elementary school, making the summer learning loss particularly insidious over those years. Back at camp, students are working hard to dodge the summer slide and grow as readers. For her second hour of reading instruction, Star sits with Betty, her Active Reading partner. Betty reads the book aloud, pointing to words, inviting Star’s comments and asking questions. Betty defines words as they read together and offers observations. Then, it’s Star’s turn. Her reading is slow and laborious at first, but nearly errorless. As she reads, she sounds more and more fluent. This sort of lesson is called dialogic reading or “Active Reading,” and studies confirm its strong impact on listening comprehension and vocabulary development. Betty and her fellow 21 reading partners are residents of Aldersgate, a Charlotte retirement community with a service-oriented outlook. The residents have been trained in Active Reading and collaborate with the campers for an hour each day. “It’s been a very rewarding process. I’ve seen my student really enjoying reading and taking initiative to learn,” said one volunteer. Active Reading was developed by Read Charlotte, a community initiative to improve children’s literacy from birth to third grade. The ultimate goal: to double the number of Charlotte third-graders reading proficiently so 8 of 10 are on grade level. For the last 15 minutes of literacy instruction, Star participates in a repeated reading fluency program called “HELPS fluency,” an intervention developed by researchers at North Carolina State University. She sits with her tutor, a trained UNC Charlotte education student, and reads the same short passage up to three times. They clarify mistakes and try again when Star hesitates until she meets personally tailored goals. For the rest of the day, Star and her fellow campers romp about Aldersgate’s sprawling east Charlotte campus under the supervision of staff from the Charlotte Jewish Community Center (JCC). “I want to give these kids as many life experiences as we can pack into five weeks,” said Daniela Becker, director of the JCC initiative. The campers play flag football and soccer, marvel at a magician and visit Charlotte’s Discovery Place science museum. They scream with delight when the ice cream truck pulls up on Fridays. While Star and the other students left camp with happy memories and improved literacy skills, the long-term benefits of this experiment won’t stop there. Charlotte-Mecklenburg Schools was impressed enough with the results that it asked Beach to train 160 instructional assistants on Sound Reading Partners, and is integrating the approach into its own summer camps for struggling readers. The YMCA is also implementing elements as part of the Y Readers initiative. Beach and her colleagues will continue to monitor the students to gain additional insight on the camp’s effect on performance throughout the year, and submit new data for publication this fall. Selected text and photography republished with permission of EdNC. by Ellen McIntyre, dean, Cato College of Education and Wills Citty, director of communications, Cato College of Education and College of Health and Human Services. Special thanks to UNC Charlotte faculty members Jean Vintinner and Bill Anderson and CMS teacher David Flores for their efforts to organize and facilitate the reading camps.